The Logitech Craft Advanced Keyboard with Creative Input Dial is twice the price of its next closest option, but its signature rotary "crown" input offers a new and intuitive method of interacting with apps and a supported operating system's user interface. With support for gestures like taps, presses and turns, the semi-customizable dial puts a range of input options at your fingertips. If you're a Mac user who has lusted over the Microsoft Surface Dial, which sports similar capabilities but only works with select Microsoft products, the Craft Advanced Keyboard is definitely something you should consider. By default, the Craft's input dial supports Adobe Photoshop, Illustrator, Premiere Pro, and InDesign across both macOS and Windows. It also offers support for Microsoft's Office suite -- including Word, Powerpoint and Excel -- though only on Windows. Upon unboxing, the high-quality premium build is immediately noticeable. The unit weighs in at just over two pounds, surprisingly hefty for a slim keyboard. This added weight, along with non-slip feet, practically eliminates movement while typing. The keyboard features a single USB-C port for charging the built in 1,500mAh battery. Since the product is wireless, the USB-C connection does not support data transfer. Rated battery life isn't listed, but judging by our time with the keyboard the unit lasts for more than ten days under normal use. This is in line with Logitech's other backlit keyboards such as the K830, which is rated for 10 days but has a smaller 1,100mAh battery. Just like their MX series of mice, Logitech's Craft can be paired with up to three devices, including smartphones and tablets like Apple's iPad. Connection options include Bluetooth or a Logitech unifying receiver. Unfortunately, the marquee dial does not yet integrate iPad support. Tapping the dial brings up an onscreen menu for selecting specific functions within an app such as brush size, chart type or font size. Once a desired option is selected using the dial, twisting the knob will adjust an item's values or settings. For example, image brightness tweaks can be quickly applied in Photoshop by navigating to the appropriate field and turning the dial. Custom profiles can be created for certain apps, and the keyboard will work without the dial if needed. At an OS level, the crown can be used for tasks like switching apps or desktops or changing volume. Unfortunately, the Craft keyboard doesn't offer way to adjust its angle, but we think the default should be fine for most. If you're used to Apple's older keyboards that have more key travel compared to modern versions with butterfly key mechanisms, you'll feel right at home on the Craft. The "spherical dishing," or slightly concave design, on the keycaps feels fantastic. The backlight brightness adjusts based on ambient lighting conditions, and dims automatically after about 5 seconds, saving battery life and reducing distractions. 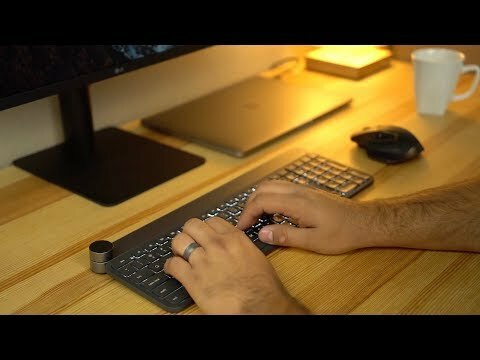 The sensors aren't visible on the keyboard, but the feature works really well no matter if you bring up one or two hands and where you place them. This is definitely a feature we'll miss when using other keyboards. As as negative, there is a fair bit of backlight bleed around the keys since, unlike Apple's, Logitech does not light each key individually. The main selling point, the crown, is surprisingly intuitive. It only takes a split second to move your left hand up and use the wheel. Unlike Apple's TouchBar, you don't have to glance down to see what you're pressing, a hinderance for editing workflows. The biggest issue at the moment is limited software compatibility, which should get better with time. There is also a learning curve with the dial, requiring users to break old habits and integrate the crown into their workflow. We produce a lot of videos, which is one industry the Craft keyboard is marketed to. Unfortunately our preferred non-linear editing system, Final Cut Pro, isn't natively supported. We did test the keyboard with Premiere Pro, and found that the dial works, though the feature set is currently limited. At this time the crown is only used for navigating the timeline. The function is useful, but I'd love to have fine controls for effects adjustments instead of using a mouse. In Photoshop, on the other hand, the dial and keyboard were very useful, allowing us to make quick work of image adjustments. The dial has proved to be a major improvement over a mouse, as the physical wheel system is more intuitive than onscreen sliders. Now that I'm used to using the Craft keyboard for my Photoshop work, it's not fun going back to using a mouse or trackpad when I'm out of the office. Coming in at just under $200, the Logitech Craft could be a tough sell, but if your favorite apps are supported, we think it's a worthwhile investment. Logitech's Craft Advanced Keyboard with Creative Input Dial can be purchased from Logitech's website for $199.99. Wish this was cheap enough to put on my Christmas list. Glad to see it’s useful in Photoshop. That was my initial thought when AI posted the first look article a while back.